November | 2011 | Shelf Elf: read, write, rave. I think it would be pretty hard to walk past this pretty book in the library or bookstore and not pick it up. 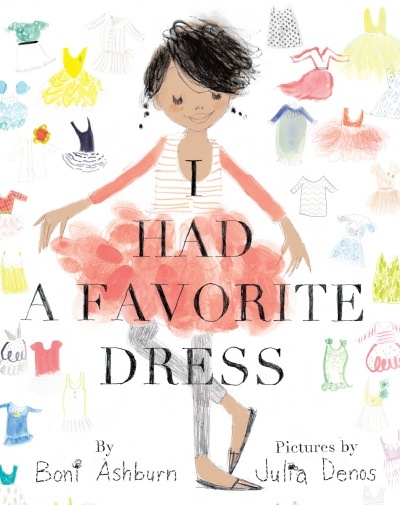 I Had a Favorite Dress by Boni Ashburn, with perfect illustrations by Julia Denos, is an ode to fashion, creativity, resourcefulness, and style. If you know a little fashionista (or a grown up one for that matter), I think she will fall head over sparkly heels for this gorgeous gem of a picture book. The main character is a little girl who loves to dress up, and loves her “favoritest” dress, which she wears on Tuesday, her favorite day of the week. But one day, she grows up a little and the dress is too short, so she turns to her crafty Mama who tells her not to make mountains out of molehills, and she snips and sews the dress into a fab new shirt. This pattern continues, with Mama transforming each article of clothing into something new, and equally stylish, until the end of the book, when the little girl makes a piece of art using the few scraps that are left of her beloved dress. What’s wonderful about the book is that it isn’t simply frilly and fluffy. It’s not just a story about loving clothes, it’s also about how clothes tell stories about who we are in the here and now. It shows readers the beginning of one girl’s journey as she discovers this form of self-expression. It shows how there is joy in making things, and how we can love something enough to find creative ways to use it again and again. You could even say there’s an environmental message here, but it isn’t shoved down your throat. 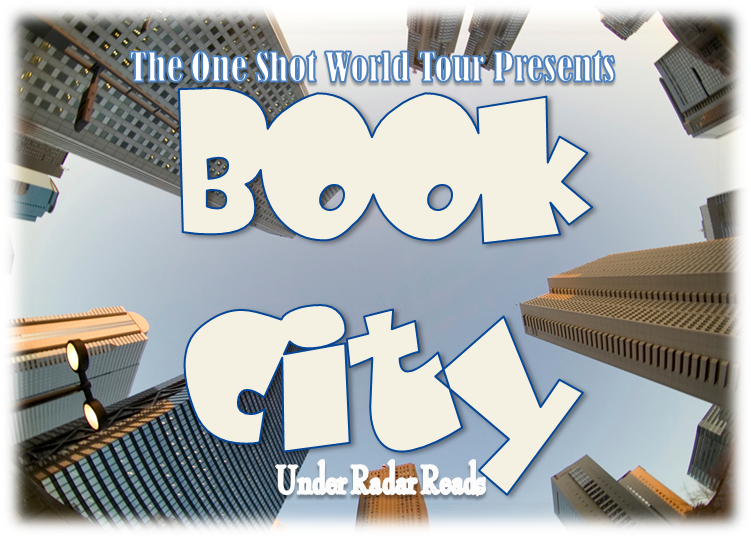 I like picture books about regular daily life and the cool things that can fill our days. It’s a book celebrating all things crafty and D.I.Y. I’d say you couldn’t find a better gift than this and some paper dolls with fashionable outfits. The highlight of the book has to be Denos’ outstanding illustrations that capture in their whimsical, hand-crafted appearance, all of the creative energy of the narrative. I love the collage elements and the dreamy watercolours and scribbly lines. It all fits together in one of those wonderful, rare, “this is the perfect illustrator for this book” packages. Read more about Denos and her artwork over at 7imp in this wonderful interview. I Had a Favorite Dress is published by Abrams. This entry was posted in Illustration, Picture Books on November 27, 2011 by shelfelf. Great. Now I want a hedwig for Christmas. Or a Pigwidgeon… she’s more his size, yes? Whatever. I just want a cute little owl to pat. Right. Now. This entry was posted in General on November 21, 2011 by shelfelf. Visually, it doesn’t get much better than this. All of the rich dark colours in the night scenes heighten the atmosphere. There’s great expressiveness in the animals’ faces and the action sequences have a cinematic feeling. The ending leaves room for a possible sequel. Lucky us! For teachers / librarians / really interested folks, Dan is offering a tremendous 275 page PDF all about the artwork and the process of creating the book. More info here. 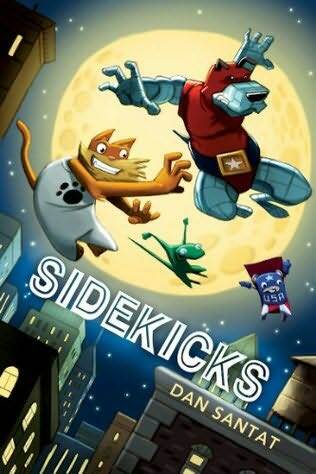 Sidekicks is published by Arthur A. Levine books. This entry was posted in Graphic Novel, Illustration on November 20, 2011 by shelfelf. Can fortune cookies change a neighborhood for the better? 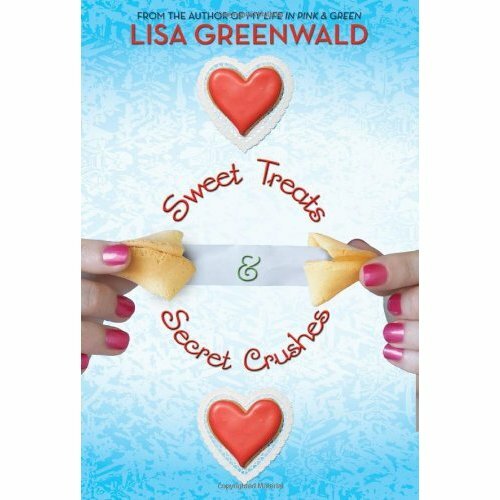 In Lisa Greenwald’s Sweet Treats & Secret Crushes they can, and I’m volunteering to test out the concept on my street some day soon. I’d like to believe that there are cities where neighbors you just sort of recognize but don’t really know yet could show up on your doorstep with a homemade treat and you’d be delighted, rather than weirded out. While this notion might seem too-good-to-be-true for many jaded urbanites, I think kids will buy into it. Plus, I do believe cookies can bring people together, and a fortune cookie, with its extra element of surprise wisdom seems as likely a candidate for bringing people together as any cookie I can think of. Best friends Olivia, Kate, and Georgia are seventh-graders who live on the seventh floor of the same Brooklyn apartment building. They’ve been friends forever, but lately their friendship hasn’t been as simple as it used to be. Georgia has a secret she doesn’t want to share. Kate thinks she knows what’s right for everyone and doesn’t hold back on sharing her opinions. Olivia can’t seem to break out of her role as an observer and take the first step when it comes to her longtime megacrush. A Valentine’s Day blizzard and resulting snow day leads the girls to create a plan to distribute homemade fortune cookies all through their building. They’re wondering if this simple idea will mend their friendship issues and help them to make their building more like one big home, where people choose to step out of their apartments and get to know one another. This entry was posted in Middle Grade on November 16, 2011 by shelfelf. 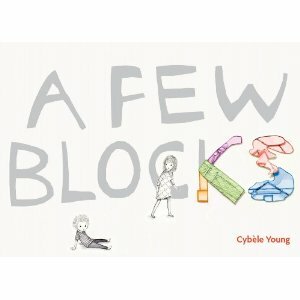 A Few Blocks is a stylish, beautifully conceived picture book that seems just right for any child, but maybe especially for a city kid with a great imagination (oh, and maybe a kid who has art-loving parents). You’ll be struck by the delicacy and detail of the illustrations as soon as you see them, as well as by the appealing contrast of black and white images followed by pages with rich, expressive colouring. It’s simple. It’s about a brother and sister going to school and the little brother doesn’t want to. The sister gets him moving by appealing to his playful, imaginative side, telling him to put on his superfast cape (coat) and his rocket-blaster boots. They head out into the city and along the way, she needs to come up with more enticements to keep them going. They move in and out of their imaginative world as they complete an ordinary walk to school. And isn’t that what so many kids do? That’s one of the best parts of this book. It feels true in the way that it captures how kids look for magic in the world they see everyday, and also in the natural relationship between the siblings. As if the pictures weren’t impressive enough, you’ll be even more astounded when you realize that they are etched paper sculpture collages. Amazing. Learn more about the author illustrator here. Young is an impressive artist and if she’s making books like this one, I’d say she’s someone to watch. I’m giving A Few Blocks to a few of my favourite kids this year, for sure. A Few Blocks is published by Groundwood. This entry was posted in Can-Con, Illustration, Picture Books on November 13, 2011 by shelfelf. Boy was I excited about this book. Thriller + Maureen Johnson + London setting = this is a GREAT idea. Right? Right. Plus, I wish you could see how the cover is a little bit iridescent so that it looks just like a creepy, foggy, ghostly street. When the book arrived in the library I practically sprinted to go get it. Some days, the library just feels like the best place on earth, doesn’t it? I skipped home with my book and I read it, just like that. I gobbled it up. Honestly. 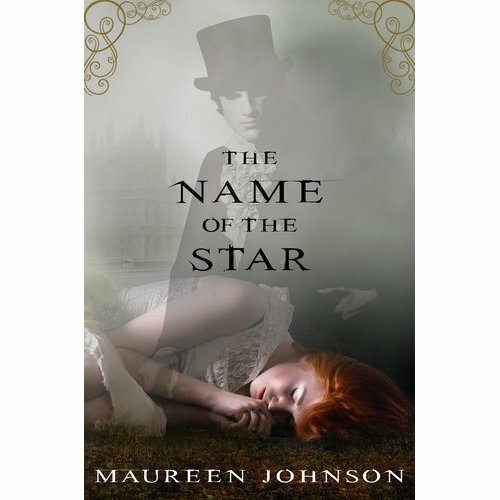 What’s not fabulous about Maureen Johnson’s books? Um… nothing as far as I can tell. Her characters are funny and clever, but not so much that you want to smack them upside the head for being unbelievable. Her concepts are always intriguing and The Name of the Star is no exception. Louisiana native Rory Deveaux ends up in London to attend private school because her professor parents get jobs for a year in Bristol. Unluckily for Rory, she arrives on the very day that a copycat Ripper-type killer begins a series of brutal murders. Soon the whole city gets swept up in the drama and the terror of the grisly crimes, and it seems that nobody has seen anything that could lead the police to find the murderer. That is until Rory sees a mysterious man who turns out to be the prime suspect. What’s strange is that her roommate, who was with her at the time, saw nothing. This inexplicable fact leads Rory to learn about the secret ghost police of London, and pulls her straight into the killer’s twisted plan. Of course I enjoyed the excitement of the plot. 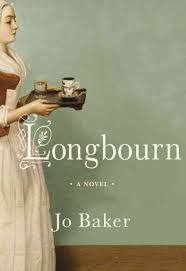 Johnson finds room for humour in what is in places a pretty gory and scary tale. I particularly liked how she builds up the idea of the “Rippermania” that overtakes London. At one point in the story on one of the nights when the whole city knows that a murder is scheduled to take place, everybody is in front of their televisions watching the Ripper reports, waiting for it to happen in order to see it unfold “live.” It was interesting to think about how the media in Johnson’s narrative capitalizes on the terror to create a weird form of entertainment, and just about everyone is ready to participate. Could this happen? Probably. I think that the media’s role in reporting crime would be a complex discussion topic for a group reading this book. I won’t give away any of the cool plot points, but let me say that I like the creativity of the supernatural element Johnson imagines. There’s just enough introduced that you’re eager to catch up with whatever happens in the next installment. Fun and freaky and atmospheric. The Name of the Star is published by G.P. Putnam’s Sons. This entry was posted in Teen/YA on November 6, 2011 by shelfelf.